Take a trip to Ancient Egyptian times when you play Pharaoh's Luck Slots. There are loads of intriguing Egyptian symbols, FREE spins, multipliers and more, including a very generous jackpot! Simply spin to win! 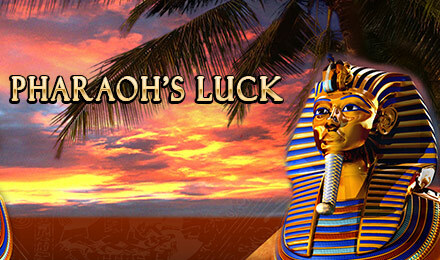 Walk like an Egyptian in Pharaoh's Luck Slots at Wicked Jackpots. You're in for an exciting adventure and big jackpot wins! The reel symbols include bold Egyptian Eyes, birds and pyramids, in addition to the traditional A, K, J and Q. Your Wild is the Pyramid, and your wins will be doubled when it helps complete a winning line. The Mask is your Scatter, and activates your FREE spins when 3-5 appear on the reels. There's also a Pick Me feature where you can choose 3 masks to reveal a coin prize.